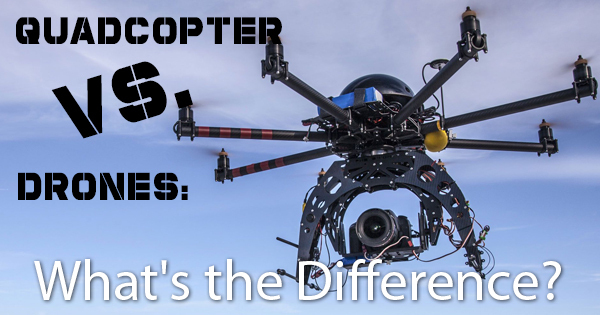 Quadcopter vs. Drones: What's the Difference? If you're considering investing in a recreational drone, you're not alone. In fact, the FAA expects that by 2020 there will be seven million drones in the United States. But while doing research, you may discover that "drone" and "quadcopter" are often used to describe unmanned aerial vehicles (UAVs) interchangeably. So are quadcopters and drones the same thing? While similar, they are in fact referring to different types of UAVs. To help you understand the difference, this article is going to discuss the key differences between drones and quadcopters. The term "drone" is used broadly to describe any kind of UAV. So, "drone" can be used to describe UAVs that are controlled remotely as well as those that are controlled by onboard computers. These aircraft generally look like a helicopter or a small airplane but can come in a wide variety of shapes, sizes, and styles, from top-secret military vehicles to tiny toys that fit in the palm of your hand. However, they are usually set apart by being engine-controlled and being able to fly for long periods of time without landing. Drones have a wide variety of uses, including military, commercial, and civilian applications. For military uses, drones can be utilized to deliver attacks and conduct surveillance. Additionally, there has been an increase of drone flying in the agriculture industry to track livestock and crop growth. Because of the possible applications and dangers to traditional, manned aircraft, drones are heavily regulated. The term "quadcopter" is more specific. It is used to refer to a drone that is controlled with four rotors. Each of these rotors consists of a motor and a propeller. Because of these rotors, quadcopters cannot usually be controlled by an onboard computer. Quadcopters generally look similar to helicopters but are able to remain balanced by the movement of the blades. When most people think of a drone, a quadcopter is what comes to mind. That's because quadcopters are the type of drone that most people use for recreational purposes. Furthermore, there is a wide variety of quadcopters available to offer different drone experiences. Many people choose to simply fly their quadcopter around outside or invest in additional equipment to be able to take pictures and videos from above. Because they're used for recreational uses, quadcopters are regulated less heavily than larger, faster drones. As you can see, drones and quadcopters are closely related. The main difference to remember is that quadcopters are a specific type of drone that is typically used for recreation. But no matter what type of UAV you have, you should always be responsible with it. After all, falling subject to common drone mistakes can lead you to look for drone repair service. If you find a reputable repair company that will ensure your UAV is fixed properly, you'll be back to flying in no time. Newer PostSo You Got a Drone for Christmas... Now What?